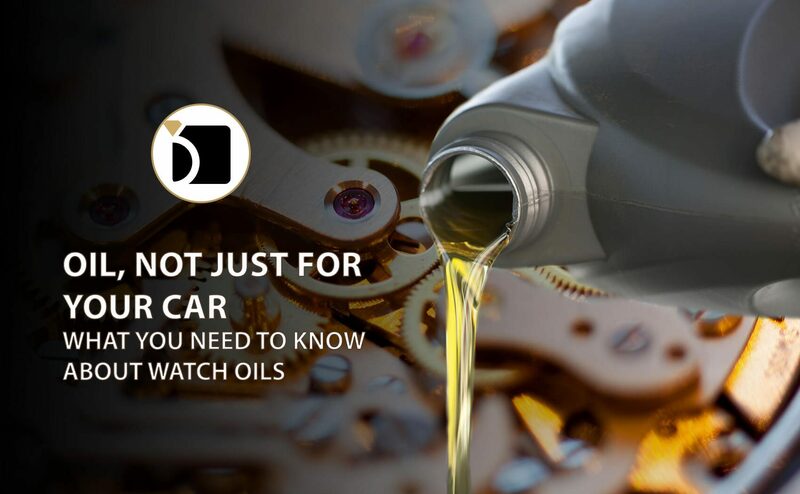 When you hear someone mention “watch oil” your first thought may be, ‘watch what?’ Just like your car’s engine needs oil to protect internal moving parts, your watch needs oil for the same reasons. Oils help to reduce friction by creating a barrier that cushions the microscopic imperfections between two objects. This helps keep your car running so you can get to work and helps keep your watch running so you get there on time. There are multiple oils with different viscosity ranges available on the market for car engines. Similarly, watches require different oils and lubricants for their moving parts. The most common oils used at My Jewelry Repair are the Moebius brand: HP 1300, 9010 and 9415. The difference between these oils comes down to viscosity and application. During the clean and overhaul process, the heavier 1300 may be used to oil the gear train jewels, while the lighter 9010 is recommended for balance staff lubrication and 9415 is used to lubricate the more critical components of the escapement. Without the proper lubrication excess friction will cause severe damage, which will result in a costly replacement of internal movement parts. Depending on the manufacture guidelines of your watch, you can expect to have your mechanical watch serviced every 3 to 5 years. If your watch is quartz (think battery operated) it too uses oil to lubricate moving parts, however clean and overhaul service is not performed as frequently due to cost effectiveness of movement replacements. If your quartz movement is vintage and/or has been discontinued, clean and overhaul may be required to restore function. Just like a tune up service for your vehicle, at myjewelryrepair.com we will oil your watch as part of our Clean, Overhaul and Adjustment service. In the early days of horology, watchmakers sourced oils from organic materials like plants and animals. Oil manufacturers now have the technology to produce synthetic oils to meet the needs of watch and automotive manufactures. For example, Fomblin grease, which is used to lubricate gaskets and is common in both the watchmaking and automotive industries, can be used in extreme temperatures ranging from -30 to+150 C (-22 to 302 F). You would use this on parts subject to friction when mineral and standard synthetic lubricants break down due to temperature changes and exposure to air. If you are getting ready to climb Mount Everest or dive deep into the cold ocean the oils in your watch will most likely have a thinner viscosity to accommodate for the colder temperatures. So the next time you are ready to take your car in for an oil change or conquer that bucket list challenge, think about the last time you had your watch serviced. MyJewelryRepair.com has certified watch technicians to perform the battery replacement and pressure test on your water resistant watch, and we also provide the pressure test results. For more information on watch repair services, please click here.